MyHeritage is announcing a new DNA testing service today, MyHeritage DNA. MyHeritage DNA will integrate viewing family trees for DNA Matches to pinpoint the connection path, and automatically identifying which surnames and geographical locations they have in common (not common ancestors at this time). I am told that a chromosome browser will be coming in future updates and that the testing chip is "industry standard" which should mean it will be compatible with Gedmatch. If you haven't uploaded your raw data from another testing company to MyHeritage yet, you may want to consider doing so quickly before they cease offering that option. We are still waiting on many details of the test and I will report back when I know more. I am not ready to recommend the product until I learn more about it, but it has exciting potential. In the meantime, I have posted some screen shots of results provided by MyHeritage. Check out the site here. TEL AVIV, Israel & LEHI, Utah, November 7, 2016 — MyHeritage, the leading international destination for discovering, preserving and sharing family history, announced today the launch of MyHeritage DNA, its global integrated genetic testing service. 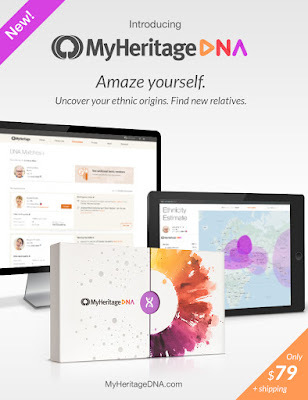 The move represents a major turning point for the DNA industry, as MyHeritage DNA debuts an international mass-market home-testing kit that is simple, affordable and will offer some of the best ethnicity reports in the world. With 85 million users worldwide, 2.1 billion family tree profiles, 7 billion historical records and availability in 42 languages, MyHeritage’s new DNA service further strengthens its position as a global leader in family history. DNA is the hereditary material in the cells of the human body and it carries within it a unique genetic record. The MyHeritage DNA kit enables users to test their DNA to reveal valuable information about their family history and ethnic origins. The kit consists of a simple cheek swab and takes only a minute to complete, with no need for blood or saliva. The sample is then mailed to MyHeritage DNA’s lab for analysis and the user is invited to view the results on the MyHeritage website. In its initial version, MyHeritage DNA provides two main features: detailed ethnicity reports that map the user’s ethnic and geographic origins, and DNA Matches for finding relatives. Additional features and capabilities are planned for the future. MyHeritage DNA results include fascinating ethnicity reports, showing the percentage of the user's DNA that come from different populations around the world. The initial reports currently include 25 ethnicities, but this will improve dramatically thanks to MyHeritage’s unique Founder Population project unveiled today — the largest of its kind ever conducted. More than 5000 participants have been handpicked for this project by MyHeritage from its 85 million members, by virtue of their family trees exemplifying consistent ancestry from the same region or ethnicity for many generations. In the next few months, the project will be completed, resulting in a rich DNA data set of more than 100 ethnicities that will enable MyHeritage to show users their ancestral roots with far greater resolution than other services. To this end, the company has been sending its DNA kits to project participants far and wide, from Uzbekistan to Fiji, from Greenland to South Africa, and every corner of the globe. Standard ethnicity reports are currently available, with the expert reports to be released at no additional cost to users following the completion of the Founder Population project. DNA test results complement MyHeritage’s core offerings, including family trees and historical records — the tools traditionally used by family history enthusiasts. DNA can be used to prove or disprove a documented family tree connection, or answer the question of whether two people sharing the same rare surname are actually related. DNA is also indispensable for overcoming seemingly insurmountable obstacles in traditional research, as in the case of adoptees searching for their biological family without access to their adoption records. On the other hand, when DNA locates a match between two people who have the same ancestor or ancestors, family trees and historical records are often essential for piecing together the exact relationship path between them. MyHeritage DNA is seamlessly integrated with the other services provided by MyHeritage on all web and mobile platforms, as well as offered on a dedicated standalone mobile app released today named MyHeritage DNA. Thanks to its expertise in family trees and its vibrant community, MyHeritage provides its DNA customers with features not offered by most competing services including 23andMe, such as viewing family trees of the majority of their DNA Matches to pinpoint the connection path, and automatically identifying which surnames and geographical locations they have in common. DNA can be a fascinating introduction to the world of family history, and customers who embark on this journey by taking a DNA test can easily use MyHeritage's tools to further explore what made them what they are. MyHeritage DNA kits are available at the affordable introductory price of $79 + shipping (prices vary by location). To order, visit the MyHeritage DNA website. MyHeritage has already amassed a significant number of DNA kits uploaded by its users from other DNA services, providing valuable matches on MyHeritage from day one. 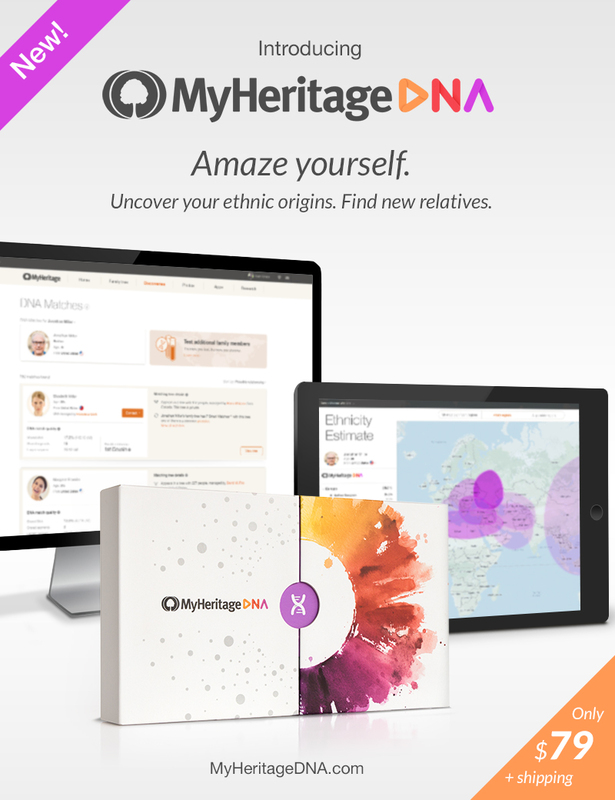 With the launch of MyHeritage DNA, the company will cease to offer DNA kits of other vendors. Users who have already tested their DNA on other services are welcome for a limited time to upload their DNA data to MyHeritage at no cost to benefit from free DNA Matches. The chart posted above, "Possible relationship details," does not show up on my DNA results. Is that something that will be specifically for those who test with myheritage, or will it apply to others (like me) who have uploaded their DNA datafiles from other testing companies? Seems like one would have to be a MyHeritage subscriber to get full benefits. What kind of costs are we looking at? I think it might be a hassle to try to maintain multiple family trees on different sites. On the other hand, my grandfather was from Mexico and of Spanish/Jewish descent. Would MyHeritage offer better research possibilities for breaking through his brick wall? The claimed matches I received from MyHeritage based on uploaded test data turned out to not share any segments of significant length (checked through GEDMatch).